Will Indian Higher Education Get Freedom from Corruption? Commonwealth Games: The Comptroller and Auditor General of India found that the final cost of the Games was 16 times the original estimate of $270 million to over $4billion. The head of the CWG is now serving jail time for charges of misappropriation. 2G Scam: The Comptroller and Auditor General of India found that the goverment lost revenue to the tune of US$ 39 billion due to corruption and favoritism to particular telecom companies during spectrum allocation. Former minister is in jail and Kapil Sibal replaced him as telecom minister, who is also higher education minister. I have been writing for a while about the lack of quality and professional standards in Indian higher education. There have been numerous reports about the corruption with Indian regulatory bodies and even institutions working as pseudo-non-profits. Of course, sheer in terms of money, higher education corruption seems tiny as compared to CWG and 2G scams, but the basic cause is no different. The primary cause is a hyper-competitive environment for resources where compromising on ethics and engaging with corruption is the easiest and fastest way to move ahead. The scope of corruption is at all levels although the scale differs. 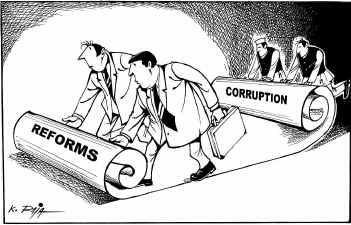 Politicians blame businessmen, businessmen blame politicians and common man blames both, but even common man is engaged in corruption when he pays bribe to get some work done. I recently watched a Hindi movie ‘Aarakshan’, which blasted the crass commercialization of education in India and how inequality and caste system is even manifested in the business of higher education. It was developed on the background of controversial reservation policy where nearly 50% of seats in public institutions were reserved for students from underserved minorities. I was amazed at how closely it was able to depict what’s wrong with Indian higher education (of course, discounting the melodrama and entertaining songs expected from a Bollywood movie). It simply asked are you participating in the corrupt system or working towards changing it? Anna Hazare is one man working towards changing the system of corruption. He has emerged as a voice of the middle class which is fed up of corruption. Hazare is asking government to draft a new law an independent ombudsman, to investigate and prosecute corrupt officials. Here is a very interesting debate on NDTV on this topic. Many of the problems of higher education will get resolved when the blame game stops and individuals and institutions set high principles for themselves by not engaging with corruption at any level. Of course, a solid quality assurance and regulatory system which is corruption-free will make the freedom sustainable. Previous International recruitment agents: Playing with fire? I see this as a tragic result of India's economic growth. Whenever there is a lot of money to be made, people who thrive on corruption will work their way into the system. Sadly, corruption is a problem as old as human civilization. You are in right place to think openly. I have observed that the way the system and problem of corruption has been cropping higher education system, I believe Higher Education can,t come out from the trap of Corruption. Because of corruption in higher education 60 percent of corruption in India is occurring. I have an idea for starting set up and managing higher education institution for corruption reduction. We can share later on. There is a need to get more reforms in the higher education system in India. Need to develop a corruption free environment atleast in the education sector which should be able to produce some genuine citizens to fight the corruption. Have to talk less about and should work it out fighting the corruption.. wish to see a zero corruption India..
Indian current education need more improvement !!! What I like most about the world wide web is that it not only connects people from around the world but in doing so it allows people to see just how alike we really are. I can appreciate your comments about the Indian higher educational system. The American higher education system is also guilty of corruption. For instance, online education is a great example of education reform. But on the other hand, there are people in the corporate sector who take advantage of the online education trend and set up schools that mask themselves as real institutions of higher learning (and they really are not accreditated or valid) for the sake of profit. That's just one example. I'm sure that there are many more. Thank you for sharing your thoughts on this matter. Many Middle Eastern Countries have allowed US and European educational corporate houses set up shops in those countries, employed many famous universities/research policy makers of US-EU as higher education consultants. But the quality of basic and higher education is not improving much in those countries. None of those countries have joined “superpower elites” so far and no sane person expect that to happen in near forseeable future. Many US and other foreign universities have set up shops/campus in India. But I am sure that will not do much good for Indian research and higher education as a whole. Quality of education in those establishments are not much better than many Indian establishments, as a whole. After all they are manned and managed by Indians for its day to day operations. In reality, those are only to encash the huge gap of supply and demand for “education” (read degrees) and also to tap the high craving for “foreign” degrees by Indian parents and students. Even a third grade US universities like DeVry is getting huge response in Indian cities and smaller towns for opening schools (primary and high school) as franchise with some local businessmen. you are sharing best information regarding to indian education, keep it up. Thanks a lot…. What about the higher education that is provided by distance learning centers. LPU advertised openly to open study centers and accepted the online study center request. Sikkim Manipal advertises on TV and newspapers spending so much money and they say they have 700+ learning centers across India and abroad. There is newly opened Mahatma Gandhi University in Meghalaya which has started opening up study centers. There are many more who are not spreading education but at the end they are only minting money. Students get easy degrees from SMU, LPU etc. and so they fall prey to these universities. What is our education department doing. There is so much of corruption and what will our country get when so many people are given degrees when they do not even go through the course. Most of these universities are taking Multiple choice question-answers which is verye easy for students to pass. We need to stop this rampant education business. Even foreign education system given way to enter India and scoop up indians promising them degrees and jobs in foreign countries are also outcome of corruption. It has been done through wrong nexus between bureaucrats, business men and politicians. Its outcome is too worse if seen closely. Particularly the student and his/her career gets doomed. Once such site is cheating Indians promising them job and study aboard. Its http://www.newstrides.com. Its CEO is Rajesh Lala, a big cheat and a trickster sitting at the heart of Delhi metro and under the noses of the law keepers who are blindly supporting his businesses of cheating students all over India!